Centrally located in Buena Park, this top floor 2 bed, 1 bath condo is nestled in an incredibly charming boutique building with a common deck & offers lovely updates throughout. Enjoy the ease of an assigned parking space, prvt deck, prvt storage & in unit laundry! Inside you are greeted by pristine hardwood flooring paired w/ elegant crown molding & an abundance of natural light throughout. Upgraded EIK offers a skylight, rich cabinetry w/ undermount lighting, stainless appls, garbage disposal, prem backsplash & granite counter tops incl raised brkfst bar. Open concept floorplan flows at ease to the well-appointed dining nook followed by the living room complete w/ Juliet balcony. Two generously sized bedrooms offer fantastic closet space. Full bathroom w/ granite vanity & tub for relaxation. 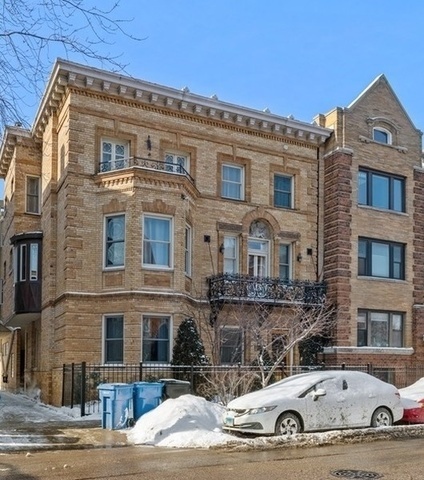 Healthy building w/ low assessments perfectly located moments to Sheridan red line, LSD express & Broadway buses, Wrigley Field, lakefront trail, nightlife, dining, tennis courts & golf course!